Need Hisense TV remote codes? If you need the codes for your Hisense TV to control it with a universal remote control, these codes will operate your Hisense TV. We have 3, 4, and 5 digit codes below for your TV that are working. If the first does not work keep trying the codes down the list. 1-Press and hold the clear TV button at the top until all 4 lights illuminate. 3-Press the pound button 1 time. 4-Go to the top and press the red power button until the TV turns off. 1-Turn on the TV and receiver. 2-Use Dish remote and press and hold the clear TV button at the top until all 4 lights illuminate. 3-Press the red power button 1 time. 4-Press the channel up button until the TV turns off. 5-Press the pound button 1 time. 6-Press the red power button until the TV turns off. Your Hisense TV can be controlled with a universal remote and work with RCA remotes, Comcast, Directv, Cox, and more. Do you have any other codes to add to the list for Hisense TV remote codes? Please leave a comment below. which remote will work with Hisense H32V77C? I need to use my Samsung home theater remote with my Hisense TV however it says to enter the 2 digit code. I can not find 2 digit codes anywhere for Hisense TVs? I bought a Hisense 43 inch LED digital TV but it doesn’t have buttons, how do I operate it without a remote control? If you have a Hisense TV without a remote control, purchase a Universal Remote that lists Hisense codes so you are sure it will be able to control your TV. Can I use/program my Samsung smart TV remote to my Hisense smart TV? I bought a Sony RM -V202 universal remote control and I can not program it to my HiSense TV. I bought a Dynex remote en31203b for my 55 inch Hisense TV, I have tried some of codes but cannot get them to connect. My Hisense TV works well and is not very old. The Hisense remote, EN-31603A, However does not work and I would like a replacement but can’t find one anywhere. If that does not work, check our TV replacement remotes page here. I have 42″ Hisense TV LCD42V88P using remote number EN 31603A. Please if you can guide me to get original or any universal remote control which can operate on my Hisense type of TV. Try going to the Hisense TV and Remote Model Number page and find the manual you need there. 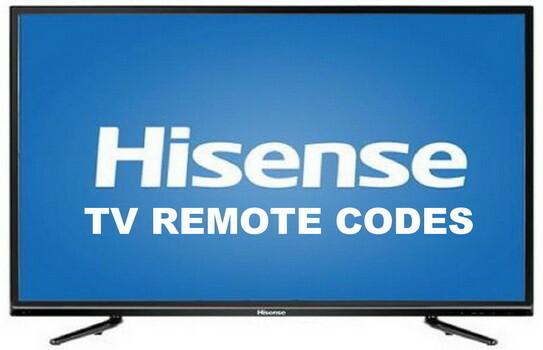 Have you tried using the remote codes on this page for your Hisense TV? I have a Star Choice URC 550 remote for my Motorola DSR 505 HD receiver . What is the 3 number code to access my Hisense 55H7B TV? The codes for URC 551 do not work. Thank you . Ed. Can I use my hi sense remote to control my DVD player? I am trying to use my Dish network control with my New HiSense Smart TV. I can Not make it work. I tried 3 digit code and i tried 174# codes. And still cant program.